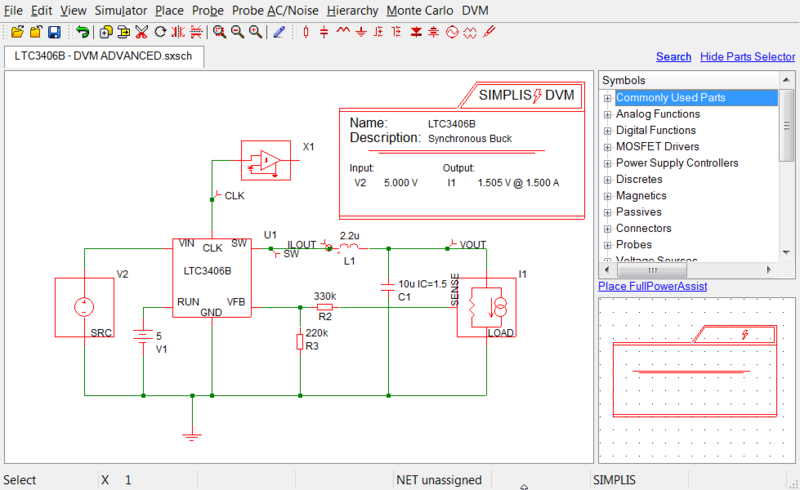 DVM comes with built-in testplans, including one specifically tailored for the synchronous buck topology. The built-in DVM testplans take advantage of Full Power Assist features that require managed sources and loads. In this section of the tutorial, you will learn how to use and configure the managed sources, managed loads, and the Full Power Assist DVM control symbol. In order to use built-in testplans for DVM automation, your schematic must include managed DVM sources and loads and a DVM control symbol. Managed-source and managed-load symbols can represent any number of different electrical definitions, depending on the test objective of a particular simulation. While the source and load symbols do not visibly change, DVM can change the electrical definition of the subcircuit called by the symbol. These are just a sample of the source and load configurations. For a complete list of available subcircuit definitions, see the Introduction to DVM. The DVM control symbol is a data-storage element containing a library of specification information about the circuit being tested. By saving the specifications for the circuit being tested to the schematic, a single testplan can be used since the specification information is stored with the schematic rather than in the testplan. The same testplan used on a 5V input, 1.5V output synchronous buck converter can be used on a 400V input, 12V output LLC converter without any modification. The DVM control symbol is, however, electrically inactive and does not contribute to the netlist. The Full Power Assist control symbol is required when using the built-in testplans, as these testplans do not contain any specification information, such as the input voltage or output current. All the examples in this tutorial use the Full Power Assist control symbol. When you execute a DVM test, the program will use the analysis information included in the DVM control symbol and change the simulation parameters, which take precedence over any parameters defined from the Simulator > Choose Analysis... menu option.